In the last decade or so, the practice of mindfulness has gained immense popularity in self-help and therapy circles. There are innumerable articles, courses, and books on the topic and a group that seems to be the most in need of being mindful is the workforce. The goal of mindfulness is to shift one’s attention inward and observe thoughts, feelings, and emotions without judgment. This mental practice helps people relax and de-stress. Mindfulness practices typically consist of breathing exercises where you pay attention to your breathing and consequently become more aware of yourself and your surroundings. 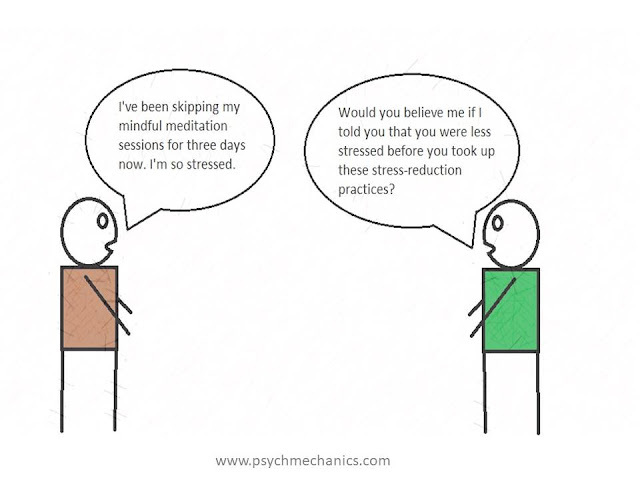 While I do not deny the relaxing effects that mindfulness can bring, in this article I contend that, overall, mindfulness is not a great idea and may work against the person in some circumstances. Why be mindful in the workplace? To understand the recent surge in the popularity of mindfulness, you have to take a peek into the lifestyles of people who seek the practice to de-stress themselves. Mindfulness is particularly sought after in Western nations where work life has become more stressful than ever. Now, the ideal way to deal with stress is to do accept it as something your body does to push you to take care of your problems or remove the external stressors. It’s understandable that the stressful nature of most jobs today can be impossible to change but mindfulness is not dealing with but escaping from that stress. The most appropriate and reasonable response to such emotions is to tackle your work or problem head-on. Sitting down, closing the eyes and ‘calming’ your mind is not going to fool your mind that the problem has gone away. Sure, you may feel calm temporarily but when you get back to work you’ll experience the stress again because the problem’s still there. Unless, in your air of positivity, you choose to ignore it. We live in a society where we’re discouraged to experience negative emotions simply because they’re not pleasant. Consequently, people have devised all kinds of techniques and methods to counter these emotions and mindfulness is one of them. I’m here to tell you that these emotions will stay with you and they’re only going way with your death because these emotions are at the core of what makes us human. This does not, however, mean you should let worry, anxiety, and depression torture you all the time. These should emotions should be properly understood, their root causes explored, and they should be dealt with by taking appropriate action. Mindfulness practitioners insist that by practicing mindfulness techniques at work, one can stay more focused on the task at hand. One of the important benefits that mindfulness promises is a greater awareness of not only ourselves but also our environment. This is why mindfulness meditation techniques involve observing your own thoughts and observing every single sound in the environment. Self-reflection and self-awareness are important but you don’t have to do weird breathing exercises to achieve these. And you certainly don’t have to take special breaks in between work to do this. Self-reflection and self-awareness cannot be forced. Allow me to provide an example from the workplace to make this idea clearer. Say one employee has had a rough day and the other has had a great day at work. Employee A is feeling bad and stressed out while employee B is happy and relaxed. The HR announces it’s time for a mindfulness meditation break. Employee B who is already at a level of relaxation will find it easy to relax more using mindfulness meditation. On the contrary, employee A who’s stressed and has a lot of things going on in his mind will find it difficult to de-stress himself through such techniques. This is why there are many people who complain that mindfulness doesn’t work for them or find it utterly boring. I find this whole striving toward focusing your mind on the present moment futile. Our mind isn’t designed to only focus on the present moment. We constantly think about the past and worry about the future and these are important skills, irrespective of how they make us feel. If we didn’t think about the past, we wouldn’t learn things and if we didn’t worry about the future, we wouldn’t strive to make our future better. If human beings have psychological mechanisms that let them deviate the present moment from time to time, there must be good evolutionary reasons behind this. There’s no point in fighting your natural predisposition to occasionally think about the past or the future. Say you’re at work and working on an important project. Suddenly, you get a call from your lover who tells you that they're sick and wants to be admitted to a hospital. I know this is an extreme example but would you go sit in a room, close your eyes and breathe or would you worry about your spouse? In this scenario, no amount of psyching yourself up and playing mind games will motivate you to stay focused on your work. Effectively, your mind considers the health of your lover a greater priority than it does your current project. This may not be true for everyone. Some people may still prioritize their work but the point that I'm trying to make is that worrying happens for a reason and your mind doesn't value all things equally. Thus, the different things that concern you are inevitably going to battle for your attention. Ideally, you want to understand why you’re not able to focus, what your mind is pulling you toward by distracting you. And then provide your mind with some kind of reassurance that things will get taken care of. Only then can you begin to be able to focus on the task at hand.